Can’t think of Blog Name ? 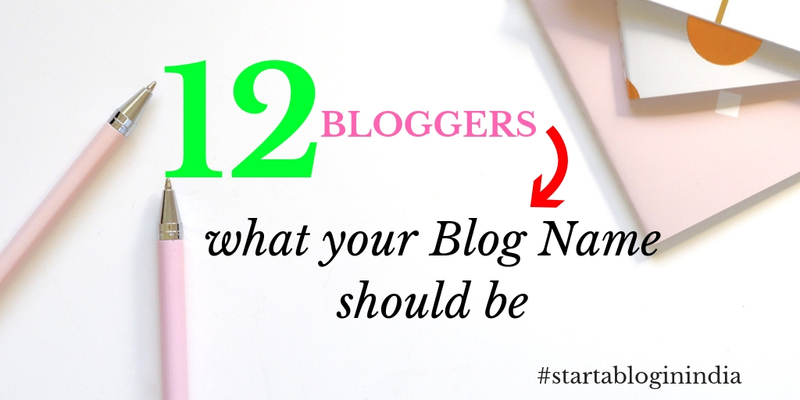 12 Bloggers share their reasons on how to come up with a Blog Name. Some share their stories on how they decided on naming their blog. These are very interesting ideas and thoughts. Initially I used to have a lot of difficulty naming my blog. My first Blog was named on a star. I do not have that website anymore. Now I name my blog based on my interests. This blog name just kind of popped in my head. I had actually started a YouTube channel by the name indianmomvlogs and decided to take that popularity ahead into the blogosphere. 1 How important is blog name ? 2 How to Choose a Name for your Blog ? How important is blog name ? While I never stressed too much about a blog name, I have known people who research like crazy for the perfect name. They brainstorm ideas for days if not months to come up with the perfect name. Me, I took like 5 minutes … but that is now. Previously it would take me months and I would get so exhausted that I would just drop the idea of even starting the blog. Don’t give up. Though it can be overwhelming, just do it ( as NIKE says). As for what to name a blog and the method ..There is no right or wrong way..
Just stick to what works for you. A blog name is important if you want to build a brand. You want people to remember you for you or your product… You can create a brand of you, your name or you can create a brand of a product ( like NIKE , Krya ). If your blog name represents your product or niche, then people can associate with you very quickly. So when I look at names like the ones below, I know what they offer. Keep them short. Longer names are difficult to remember. Search engines display only a limited number of characters, if your url or website name itself sooooo long, how will it fit ? Make it easy to read… Some names are such a mouthful.. I dont even bother to remember. Sadly they might have been the best in their industry, but I forgot their name. They lost me as a customer and probably they have lost many more like me, who are reluctant to jot down a name. How to Choose a Name for your Blog ? I asked bloggers with real blogs how to choose a blog name… specifically newbie blogger tips and here is their response. The name of the blog should be meaningful. It should give idea about the central theme of your blog. It should definitely sound positive. It should sound attractive, easy, and something different to help readers remember the name. I usually recommend others to name their blog by using their name. The reason why I suggest it is because your name is already a brand of it’s own why not use it as your blog name. As for blog name ideas, don’t make it too long of a name because that’s a lot to type down. Write out a few keywords in your niche and go off from those keywords to make it your blog. Chose something that you hold dear but not too common. Check for availability in major social medias too. Choose what you are passionate about and always be unique. Don’t follow trends and make sure to learn a lot from how others chose their names. Try creating interest by naming the name of the blog, it is still the first one to see. Catch as many as possible from the beginning. I started blogging after motherhood. I faced many challenges and wanted to share my experiences here. At the same time, I wasn’t ready to share details of my life and my kid’s name. So, he was christened as Penguin and since the blog has my son as hero. It’s “Life with my Penguin”. The blog name should relate to what your content will be about. This is important as it helps readers find you more easily. Sometimes you have to get creative if someone else already has your idea. The best way to name your blog is using simple, catchy and relevant name related to your niche and target audience. My target audiences are bankers and u want to educate them so I selected BankerEdu. I have another blog called selfcarepro.in where I discuss about product reviews related to personal care. My audiences are those who want to take care themselves . So I chose SelfcarePro as my blog name. One more thing don’t just name your blog , give tagline to it. This way you are showing your viewers what you really what to give to your audience. Your blog name should reflect what your blog is about. It doesn’t need to be absolutely clear just by the name, but it should be related. A huge factor in deciding the name is also dependent on whether the domain name you want is available or not. I checked for hundreds of domains before I finalized the name – ‘Craft of Blogging’ for my blog. If you’re just starting out, don’t fret a lot about the name. You can always change it after a weeks or months of starting. Figure out what your topic is and write down words related to that topic. CREATE COMBINATIONS -make combinations (bonus points for rhyming/alliteration). TIPS TO REMEMBER keep it short and easy to spell & remember choose a name and start blogging don’t waste weeks brainstorming the perfect name. Naming the blog rightly is as much important as the blog itself as it draws target interested visitor to your blog. This is tricky and sometimes subject to availability of the names you intend to keep. Name should in the context to the subject of the blog if it is targeted to a specific audience. What are your thoughts on how to come up with a blog name ? Blog name creates an identity for bloggers. These tips can help newbies. These are some great tips. My blog name is based on one of my nicknames and the French word ‘Ville’ for town or place. Nicely done post, it helps the new bloggers like me.